I do read some books and really find them hard to review, especially if the writing is so great and captivating and the story so absorbing. Tamara Grantham’s Spellweaver: Olive Kennedy is one such book. Book Two in the Fairy World MD series, this book has a lot to offer fans of urban fantasy. Readers are introduced to Olive Kennedy, a half elfin girl who travels to a magical world to save its magic from a vengeful and powerful spell weaver. But saving a magical world isn’t a walk in the park and Olive will face many challenges on her way. The good news is that she easily wins the trust of allies like the dragons, who will play an invaluable role in this adventure. There is the Viking warrior and son of the Viking king, Wult, who stands by her all along, but things could change should she learn what Kull’s past is. The reader is interested to know if the two will end up falling in love with each other. Faythander, the land with magic, also has dark secrets that raise the stakes in the conflict. 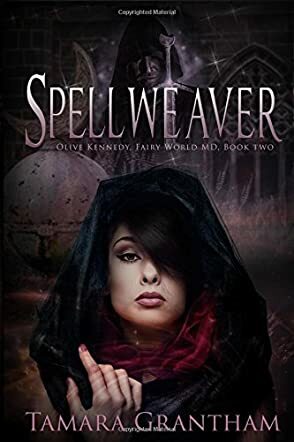 Spellweaver: Olive Kennedy has a lot of beautiful and powerful literary elements that make it stand apart as a very engaging and highly entertaining story. The plot is well imagined and executed with exceptional mastery. The characters are very convincing and real, even though many of them are drawn from a world with its own rules. Olive is a well-developed character that readers will love to follow as she matures in the story. It’s beautiful to see her take control of the destiny of Faythander. The setting is fascinating and the drama so intense that it will have readers utterly absorbed. Tamara Grantham is a skilled storyteller and I can’t wait to read other books in this series. A good fantasy with a fast-paced, beautiful story line, interesting characters, and well-developed conflict, Tamara Grantham’s Spellweaver: Olive Kennedy will be a huge delight to fans of the genre. Olive Kennedy, a half-elf, goes on a very challenging adventure to help save Faythander, a magical world under threat from a powerful goblin king. But what lies ahead could be more than she’d bargained for. Teamed with a very skilled and experienced Viking warrior, Kull, can she beat the odds stacked against her? Can things remain the same when she discovers the dark secrets of Faythander and Kull’s questionable past? First off, I enjoyed the beautiful setting, the magical names of places and the introduction of magical creatures like the dragons, the villainous spell weaver and shape shifter, and many others. The author has an unusual skill to keep readers interested and engaged throughout the story. The story has many surprising turns and readers are never quite sure about what they will find when they turn the next page. No, nothing is predictable about the story. Also, the author touches on many beautiful themes, including love and friendship, the eternal struggle between good and evil, vengeance, and of course, loyalty. Book two in this series takes off where book one ended, and although I never read the first book in the series, the author has done a brilliant job to make it read like a standalone story. Tamara Grantham has a skill for narrative, plot, and character development, and many readers will find themselves in dreamland as they get immersed in the world of Spellweaver: Olive Kennedy. Spellweaver: Olive Kennedy by Tamara Grantham is the second book in the Fairy World MD series, a sequel to Dreamthief and a riveting story that will undoubtedly delight fans of fantasy. Readers are introduced to a magical world with an exceptional setting; it’s a world that cohabits with the physical, somewhat real world of humans. The magic of Faythander is under serious threat of destruction from a selfish and ruthless, shape-shifting goblin king, Seth. Now, Olive must do everything she can to save this magical world and its magic. The question is: Can she stand against the might of the vengeful goblin king, even with the brave Viking warrior Kull by her side? What happens when Kull’s past catches up with him? What about the dark secrets of the magical world she is dying to save? Spellweaver: Olive Kennedy has a compelling cast of characters, including legendary creatures like the elves, the majestic dragons, the pixies and others. Olive, the half-elf is a very compelling character and it is wonderful to see how she grows throughout the story. As the plot advances, one notices that she becomes more and more confident and realistic about her choices. The alliances and the friendships she makes in this adventure are vital when it comes to understanding the conflict and building the plot. The writing is stellar, with beautiful and powerful descriptions that integrate elements of the plot and characterization, often punctuated with engaging dialogues. The conflict is developed at different levels. Olive has her own problems when the story begins, but she’ll understand that there are different entities, each with their specific interests and priorities. I loved the themes explored in this book, especially heroism, loyalty, and bravery. Tamara Grantham has won my heart with her storytelling skills and I will be looking forward to other works from this author. We join our heroine as she battles through the treacherous badlands of pixie swamps in Spellweaver: Olive Kennedy. Tension is high, especially when the arrival of some former allies heralds some disturbing news. The Everblossom is transferring its magic into Uli, its speaker. Something only done in times of real peril. The tree is fearful, and without it all magic in Faythander will become no more. There is no choice but to walk the treacherous path to the tree. But their arrival sees them bear witness to a horrible event. Geth has succeeded in his plan. The tree's magic floods from Yuri to a small flower, but such is not enough to sustain the magic. Geth vows to find the flower, destroying the only hope of restoring the powers to Faythander. But with the loss of magic comes a greater danger. Those born of it will die. Worse still, the memory block and altered memories forced into Olive's mother will begin to weaken. What should happen should she remember her hatred for her daughter, her vow to sacrifice her? Olive is forced to reply on her allies, juggling her life in Faythander and her one on Earth. But not everyone is who they seem. Spellweaver: Olive Kennedy has a number of unexpected revelations that will take the reader by surprise. Tamara Grantham's style is fitting with the young adult genre, although will easily be enjoyed by the adult market too. Some of the twists will keep you flicking the pages, pushing you onward through the action packed turmoil to discover what happens next. There are things you can't wait to uncover, and questions that must be answered. Tragedy, betrayal, love, lore, and magic, what more could you ask from a fantasy? But be warned, once this tale has its claws in you, you won't want to put it down. Spellweaver by Tamara Grantham is a riveting follow up to Dreamthief. Olive Kennedy is a therapist for people who exhibit signs of going to the fairy world. For the past two weeks, Olive has been helping her Viking sidekick Kull search for his sister. Their search takes a turn when the pixie, Uli, warns them that the Everblossom tree (where magic resides) is being destroyed. Upon the tree’s destruction, the only chance magic has of being restored is to get the blossom to a place spoken of in prophecy. Between saving the world and breaking up with her boyfriend for her Viking love, not much else reigns in importance, except maybe a goblin intent on killing everyone, her Viking’s two exes, and a king who thinks she isn’t good enough to be with his son. Olive juggles two worlds, two lives. She has a life on Earth with her mother who doesn’t remember her (or their) real past, a boyfriend she keeps meaning to break up with, and patients that rely on her. Spellweaver left me wanting more. Olive is endearing in her struggle to find hope to save those she loves and hold onto her Viking. She’s relatable and sympathetic. It’s easy to be pulled into her story, into her world. Tamara Grantham has a world filled with fantasy and myth, but everything familiar is seen in a new light. She has a refreshing take on fairy lore. There’s a rich history and backstory to this world. This is the series you want to immerse yourself in and follow the adventure. Spellweaver is a wonderful blend of fantasy, romance, heartache, and adventure.